Thank you for contacting Mearto with your appraisal inquiry. So that I may best assist you, can you please confirm that there are just three green glasses and one different glass, from the photograph it is sort of turquoise in color? The decanter (the tall vessel with the silver overlay may have makers marks - they will be TINY and hard to spot but if you can find them and upload a clear photograph, it will help identify if these are German, Italian, Czech, etc. Hi there! Thank you for the quick response! 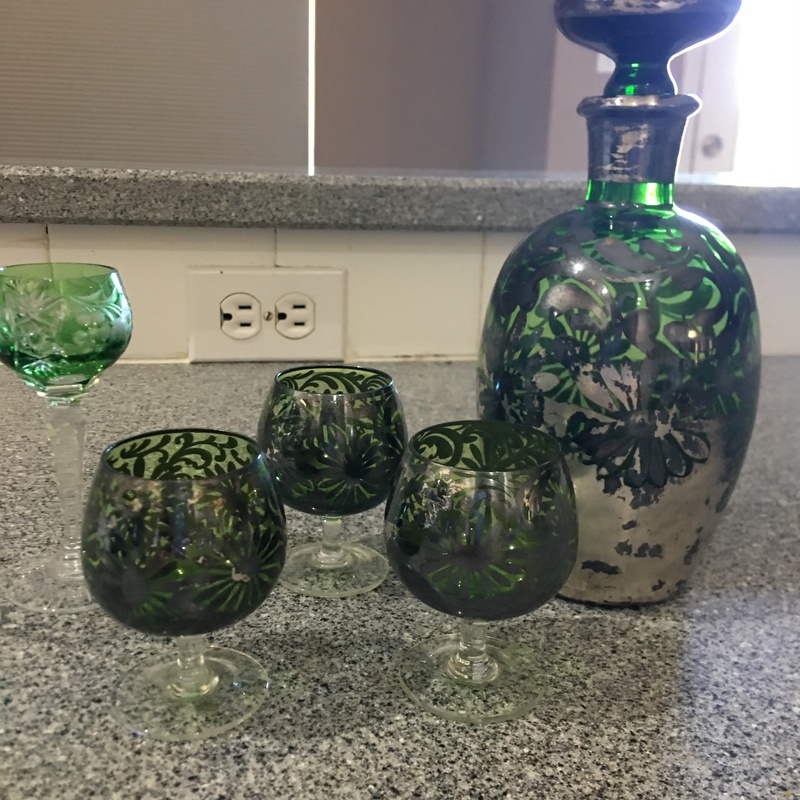 There is 1 decanter with 3 matching glasses. The glasses are about 3 inches tall. The decanter in marked with the number 807 on the bottom. It's lid is marked with the number 476. There is a crystal with bluish glass (also 3 inches tall) and another glass with a green hue that is more intricately etched that looks about 5 inches tall. Thank you!! Thanks so much for the additional photos. Let us know if you have additional items to appraise, and thanks again for using Mearto.